There’s no doubt about the fact that the New York Jets’ quarterback controversy at this point is basically a manufactured creation of the ESPN spin machine in Bristol. Mark Sanchez isn’t a good quarterback and neither is Tim Tebow. So many simply want to start Tebow because of what he did last year with Denver and the fact that he won two championships (only one as a starter) at the University of Florida. That’s all fine and good, but as we all know, success in the NFL doesn’t always translate to success at the next level. You can ask a lot of USC quarterbacks about that. There would be no Tebow sightings in East Rutherford on Sunday given that he was injured, so who had to play the role for backup of Mark Sanchez? Greg McElroy? Greg McElroy? The name sounds more like something that’s associated with a New York or New Jersey State Senator rather than an NFL QB. But Greg McElroy was taking snaps vs. the 4-7 Arizona Cardinals. The Jets were 4-7 themselves coming into this game and virtually have lost any shot at making the postseason a long time ago. The Cards have lost seven consecutive matchups after starting the season on a promising 4-0 note before the injury to Kevin Kolb. If you are the kind of fan that loves defense and low scoring games, then this was your game. By halftime, the score would be 3-0 Arizona. Or, should I use the old baseball cliché where the score was actually 3-0 Diamondbacks leading the Mets heading into the Bottom of the 5th inning? Regardless, though, New York did get another impressive performance from Shonn Greene. He looked like the lone standout on offense for either team with 24 carries on 104 yards. Those 104 yards were more than the yards any of the QBs had. For the Cardinals’ Ryan Lindley—10/31, 72 yards, one interception, and 2 sacks. For Sanchez—10/21 for 97 yards, 3 interceptions and 3 sacks. Two of those interceptions came from Kerry Rhodes. If the Arizona Cardinals’ defense was combined with a competent offense (think New England or Denver) you would probably have your Super Bowl team right there. Then, behind for most of the game and not scoring any points in the game, McElroy comes in and throws the game winning touchdown early in the fourth quarter with a 29 yard pass to Jeff Cumberland. Gang Green wins 7-6. Apparently, the two teams forgot the memo that collegiate football teams play on Saturday and not Sunday. Also, that one touchdown pass from McElroy will be enough to send Gotham’s tabloid press into a frenzy. 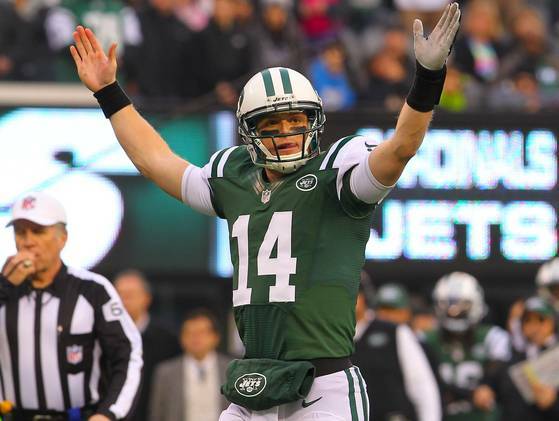 Cue the stories of there now being a three-way QB “controversy” for the Jets when there may not be one at all. In Week 14, 4-8 Arizona travels to Seattle to play the Seahawks who currently would be the sixth seed in the NFC if the playoffs began today. The 5-7 Jets will face the Jaguars in Jacksonville. The Minnesota Vikings need to find a way to reschedule their last four games to be played at the Hubert H. Humphrey Metrodome this year. Their 6-5 record coming into their game in Lambeau Field vs. the division rival Green Bay Packers was mainly due to a 5-1 showing in the 2012 season at home. They were an atrocious 1-4 on the road. Meanwhile, Green Bay was coming off a game on Sunday Night Football vs. the New York Giants in which they got embarrassed—and a little bit exposed. They lost 38-10 to the G-Men and let Eli Manning throw 3 touchdowns. This was coming when the Pack were shorthanded on both sides of the ball. No Clay Matthews, Charles Woodson, Sam Shields, or Greg Jennings. Jennings did return, but still, no Shields, Matthews or Woodson vs. the Purple People-Eaters. Adrian Peterson knows a thing or two about injuries since he’s coming back from one—and doing so in authoritative fashion. He had 21 carries for 201 yards including an 82 yard run for a touchdown that, at one point, had Minnesota ahead 14-10. The Vikes could’ve extended out that lead before Christian Ponder threw one of his two interceptions while in the red zone. Such a team is beginning to remind me of the old San Diego Chargers teams from the mid-2000s when it was clear that they were winning football games on the back of LaDainian Tomlinson and not Philip Rivers. Also, given this season and the average career length of NFL runningbacks, it’s time to start mentioning Adrian Peterson as a future Hall of Famer. For this season alone, he may wind up with 1900+ yards. Any football writer who doesn’t vote for either him or Peyton Manning as Comeback Player of the Year should either have their credentials stripped from them or should be drug tested. Both are probably the favorites for the MVP award as well. 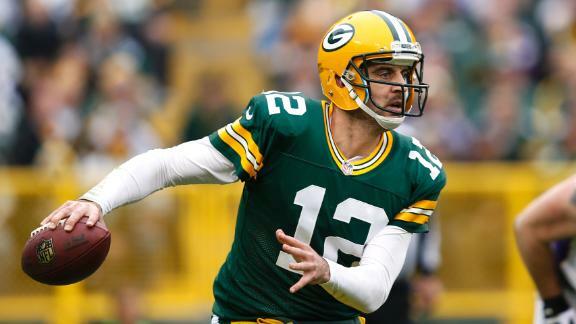 As for the Packers, Aaron Rodgers was 27/35 for 286 yards, threw for 1 touchdown, and 1 interception. Also, this has been a much maligned season for kicker Mason Crosby, but he did convert 3 of 4 field goals on the day. The Vikings are now a 6-6 and football team and they are 1-5 on the road. That statistic shouldn’t make anyone who bleeds the pigskin version of purple and gold optimistic even if they are able to sneak into the playoffs past the Buccaneers, Seahawks, and Bears. This looks less likely after this week. Also, not utilizing Adrian Peterson in the red zone? Who was calling those plays for the Vikings? Their mascot? They will stay in the division and will return to their “Dome Sweet Dome” in the Twin Cities to play the Chicago Bears. As for the 8-4 Packers, they’ll be on NBC’s Sunday Night Football next week against the Detroit Lions. Between the diagnosis of leukemia for head coach Chuck Pagano and the seemingly overnight sensation that Indianapolis Colts’ rookie quarterback Andrew Luck has become, it has made for one of the most intriguing stories this NFL season. Heading into their game with the Detroit Lions at Motown’s Ford Field, they were 7-4 on the season. This was a position that no one (myself included) thought they would be in after coming off a 2-14 with Peyton Manning injured. Also, we all know that he only went 3-13 in his rookie year for Indy. Detroit is coming off a heartbreaker of a home loss to the Houston Texans who at the time were playing 2 overtime games in less than a week. But, they did make fans in Houston think about their own team’s defense which for 9 weeks looked like the best in the league. They’d be on display again in a huge fashion. Matthew Stafford went 27/46, threw for 313 yards, 2 touchdowns, and 1 interception. And they call Calvin Johnson “Megatron” for a reason. He caught 13 passes for 171 yards and 1 touchdown. There’s a reason he was targeted almost half of the time when Stafford was looking for a receiver to throw to. Late in the fourth quarter, it looked academic. The Lions would pull off the upset of the AFC South’s Colts—something they were unable to do vs. the AFC South’s Texans. They led by a score of 33-21 going into the game’s final minutes and Luck was playing a game that was shifting the rookie of the year pendulum back in the direction of Robert Griffin III. Then with 2:39 left in the game, he threw two of his touchdown passes. The first was to Lavon Brazil for 42 yards. The last one that one the game went to Donnie Avery for 14 yards as the Colts took only their second lead of the game—the one that mattered ultimately in the end. The Colts won 35-33. 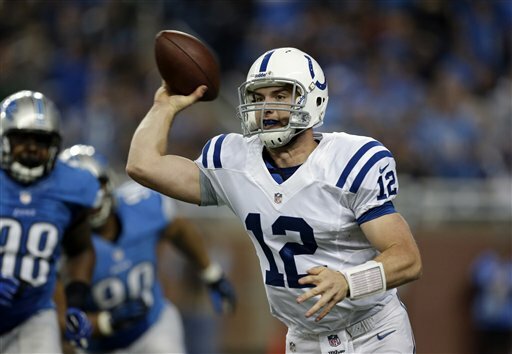 For the game, Andrew Luck threw for 24/54 for 391 yards, 4 touchdowns, and 3 interceptions. T.Y. Hilton would be the leading receiver with 6 receptions for 100 yards. Avery caught two touchdown passes on 5 catches and 91 receiving yards. The Colts pulled out another one just as they did earlier in the year vs. the Packers at Lucas Oil Stadium. That game, of course, was their first game after the organization heard the heartwrenching news that Chuck Pagano had leukemia. Now they’re 8-4 and sitting pretty in a weak AFC in terms of their playoff chances as a Wild Card. Also, they’re the 5th seed right now if the playoffs began today. Guess who they’d face at this point in the first round of the playoffs? Your head is in the ground if you don’t think the media is pulling for the seedings to stay exactly as they are right now. Peyton Manning vs. his former team and the quarterback he was supposed to be mentor for. There’s an easy storyline right there. Indy will go back home to play the Tennessee Titans. The 4-8 Lions head to Lambeau to the play the Packers on Sunday Night Football. Ok, it’s certainly fun at this point to look at the playoff races. I’m now doing a “If the Playoffs Started Today” section for Monday Morning Realist that I have temporarily shelved for this week’s column. There were plenty of other interesting games this week. The Steelers got a huge win over the Baltimore Ravens that kept their playoff chances alive. They’re now 7-5. Cincinnati Bengals are now also at 7-5 after defeating the San Diego Chargers in San Diego. Even the Kansas City Chiefs won their game this week 27-21 over the Carolina Panthers. Of course, though, that football victory was nothing compared to the personal loss the Chiefs organization went through on Saturday. Early Saturday, news broke that Kansas City Chiefs linebacker Jovan Belcher had taken the life of not only his 22 year old girlfriend, Kassandra Perkins, but also himself as well. 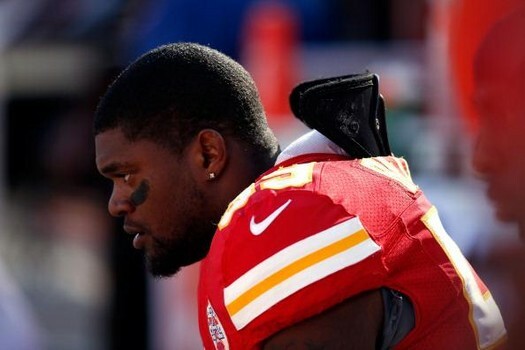 This didn’t happen in the home or abode of Jovan Belcher, it occurred in the Chiefs training facility. Also, it happened right in front of general manager Scott Pioli and head coach Romeo Crennel. The saddest thing to come out of what happened on Saturday morning was that a 3-month old little baby is now without a mother and a father. On behalf of everyone at The Real Sports Talk, I’d like to send out condolences to the families affected by these tragic losses as well as to the Chiefs’ organization. It still pains me to know two things. Number one, CBS led off The NFL Today with a conversation about the playoff picture heading into Week 13 instead of leading with the Belcher tragedy. Also, the NFL still didn’t consider either canceling or even rescheduling the game for a later date. The rest of the Chiefs players and coaches knew Belcher, if they knew about the personal issues he was going through, that’s for them to say and not us to speculate. Regardless of that, they were friends of his even though he committed two heinous acts that morning. I’m sure those players and coaches are now wishing they could’ve possibly done more to persuade Belcher not to have it come to this. I’m a sports fan. We all are sports fans. Having that affiliation as a fan with a team and going through that team’s ups and downs is a tradition as American as baseball, hot dogs, apple pie, and Chevrolet. But even with all of that being true, there are moments like these when we realize that these are human beings just like the rest of us. They may be stronger, faster, and spend more time in the weight room than a lot of us, but they’re still humans with all of the issues that humans have to go through and many of those could be personal. Prior to the game, a moment of silence was held at Arrowhead Stadium to bring awareness to the crime that is domestic violence. Belcher’s name was not mentioned during any of the pre-game proceedings, nor should it have been. Belcher took, what he probably felt, was the easy way out instead of using better methods to work through the issues he was having with his girlfriend so they can reconcile. Even if he didn’t want to do it for himself, or even Kassandra Perkins’ or Kassandra Perkins’ family, then he should have done it for his 3 month old baby. Even in a week of football where we are four weeks shy of the postseason beginning, this week of football was rendered meaningless because of this atrocity that took place in Kansas City, MO/KS. The Chiefs’ 27-21 victory over Carolina was, arguably, the most emotional for a team this year (there’s also a case for Indy’s over Green Bay after the Pagano news). The Kansas City Chiefs have announced plans for the creation of a fund to support Zoey, the 3 month old daughter of the late Kassandra Perkins. “The one thing people can hopefully take away, I guess, is the relationships they have with people. I know when it happened I was sitting and in my head, thinking, what could I have done differently. When you ask someone how they are doing, do you really mean it? When you answer someone back how you are doing, are you really telling the truth? Well said, Brady Quinn. Well said.